I'm pretty sure I've found the key to mental health, if not bodily. I might just have to add a glass of red wine to every dinner. Yeah, you heard me. This job schedule (4 hours of commuting a day, give or take) gets me home around 830 every night (after leaving around 715am). I haven't had much time to grocery shop (or do laundry, or clean, etc), so I realized the other night that I had NOTHING, I repeat NOTHING, for dinner in my fridge. A few open containers of baking soda, some coffee syrup, elderflower liqueur, expired blueberries, leftover beers from my party (IN APRIL! ), and mustard, A-1 sauce, etc. I had plenty of stuff in my freezer, but I wasn't in the mood to defrost and/or cook. Solution? 2 Creamsicles, a wedge of Laughing Cow cheese, and a generous glass of red wine. I've had a glass of red almost every other night this week. Sunday I forgot, so I guess I'll have to make up for that later. ;) Stay tuned..this could get very interesting. Some people look to the sky for the first falling leaves, or the first floaty flakes of winter to herald the shift in seasons. I rely on my craving for cocoa to increase exponentially. And it has. Yes, I am one of those folks who truly LOVES winter. Luuuuurves it! It's in my blood. Growing up in Massachusetts, blizzards were one of my favorite things (granted, I didn't have to drive in it or shovel it! 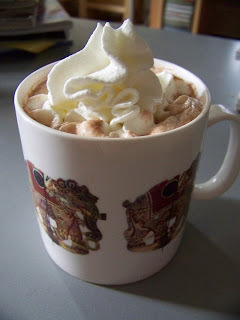 ), and few things were better after hours of playing in the snow than coming home to a cup of hot cocoa. Make no mistake: this is no Swiss Miss packet (not that there's anything wrong with that). However, my craving requires a rich, chocolatey, luxurious experience. This is my french hot chocolate mix which they serve to the hoity-toity folks at Paris's Georges V hotel. One day I will try it there, but for now, I splurge once a year at chefshop.com and bring it to my Bay Ridge abode. I heat the milk up on the stove and whisk in the cocoa with my Williams-Sonoma whisk. I pour it into one of my many mugs, top it with a hefty dose of Redi-Whip, and curl up contentedly on the couch with my cats and my DVR. One of my favorite restaurants in NYC is Bay Ridge's very own Areo. The prices are more Manhattan-like, but the food and service are definitely worth it. I used to try something different every time I went (always worth it) until the day I decided, on a lark, to try the eggplant rollatini. I can't even tell you why I picked it--it just jumped off the menu to me, and I've ordered it the last 3 times I went (that's a lot for someone who likes variety as much as I do!) 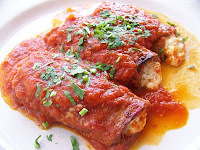 This dish never fails to impress--I love their red sauce (not sweet at all), the ricotta filling is gooey and flavorful, and I can never manage to finish the whole thing. Consider Areo very highly recommended by this chick. :) It can get very noisy and boisterous at night, but it's worth it for classic Brooklyn people-watching. Lunch is more laid-back, but I do consider this place juuuust a little pricey for lunch. Either way, show up hungry, and eat well! Mangiamo! 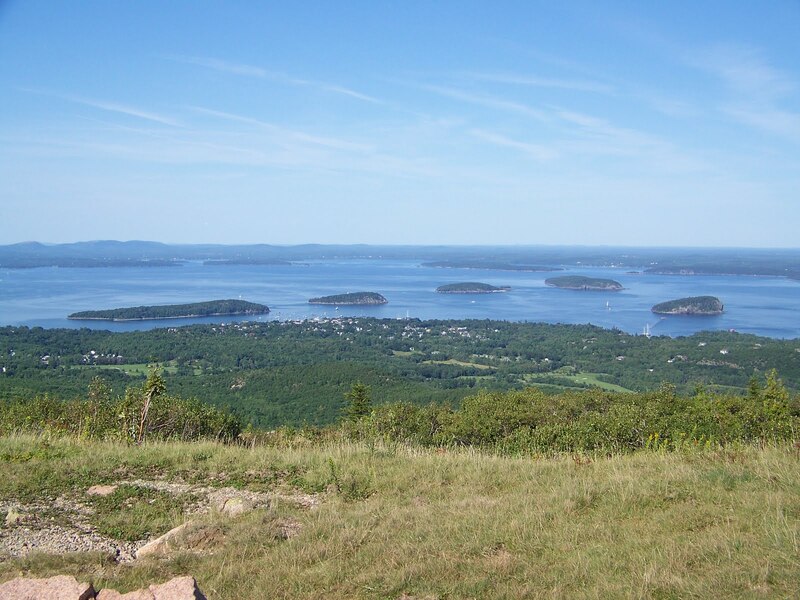 I do so love Bar Harbor (I basically love all of New England, especially Maine, Massachusetts, and Rhode Island. This will no doubt become quite clear as this blog continues). It's a "big" feeling small town, sure, often crowded with tourists, but never as crowded as NYC! 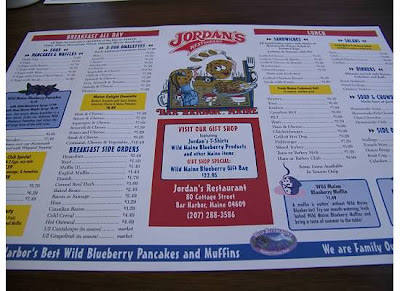 When ABF & I planned our first trip there together (we'd both been before but not with each other), he kept talking about Jordan's a must-stop for breakfast. It didn't take much convincing. We made it our breakfast stop on our last morning. 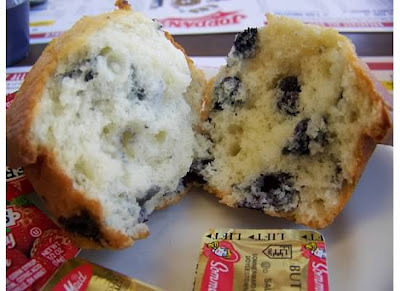 I couldn't get enough of the blueberries, so I ordered a blueberry muffin. Light, airy, but enough to it to feel like you were actually eating something. 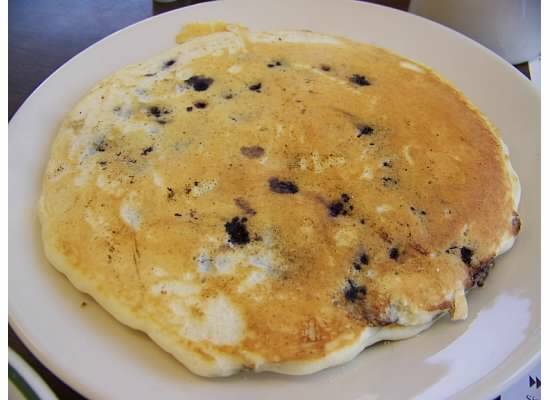 Oooh--lots of berries in that cross-section. 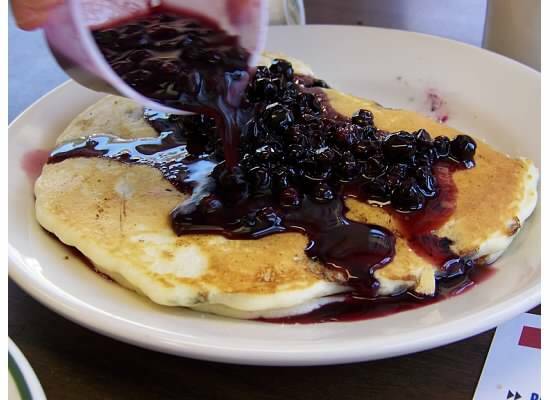 We split an order of the blueberry pancakes. 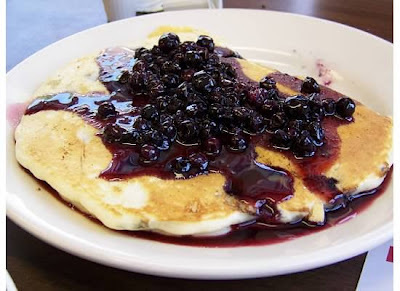 I do so love some blueberry overload--not only are the berries in the pancake, but they're in the rich, purplish syrup, too. Not too much sugar, just ripe, juicy, unadorned berries. The coffee was delicious, too--we brought home some Jordan's mugs to go. It's a no-frills, family-friendly spot with booths, counter seats, and formica tabletops. 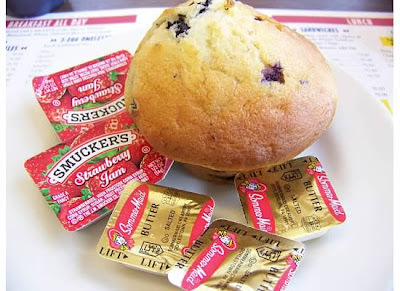 Breakfast was delicious, affordable, and quick--we'll be back for sure! One of our first stops on the East Coast trip was also one of our best. 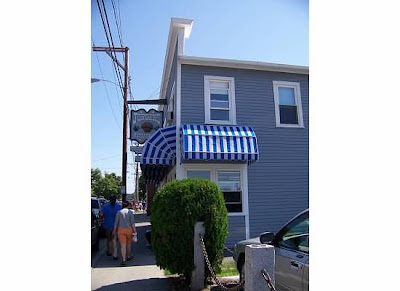 I didn't know much about Warren's before we visited--it was just right over the bridge from New Hampshire in Kittery, Maine. 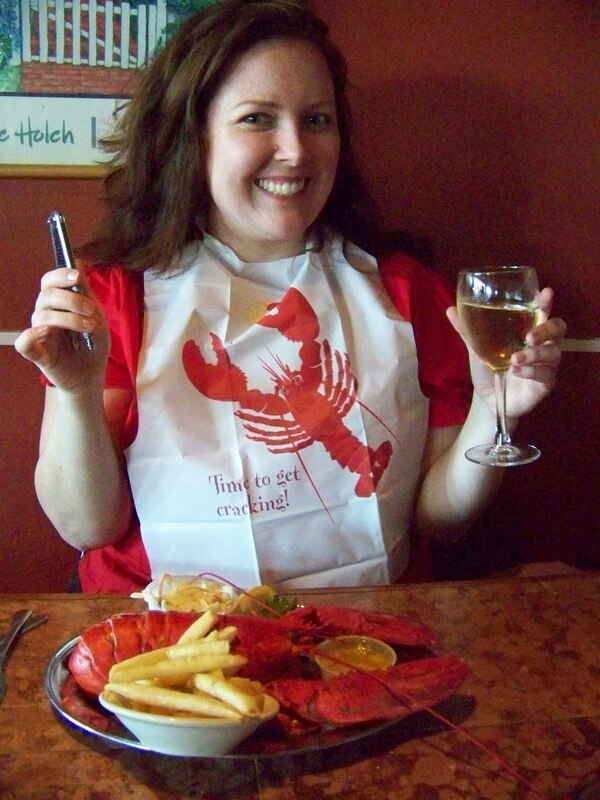 Seafood isn't their only claim to fame--this place also has a killer salad bar. 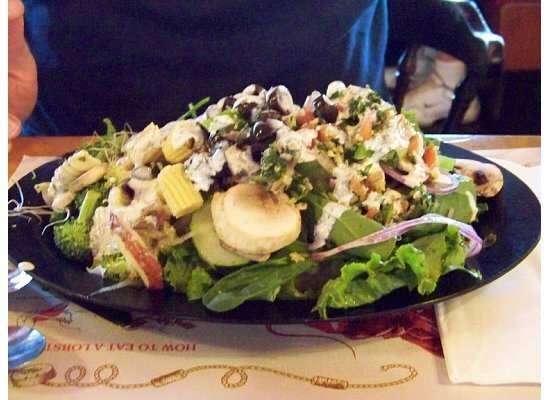 Every topping imaginable and THEN some, all kinds of greens, way more than your basic iceberg or romaine. 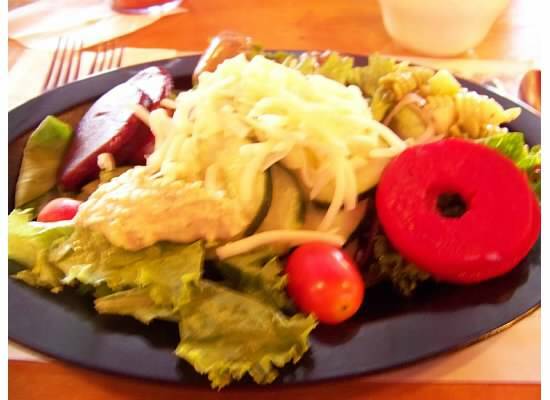 I piled mine high with greens, beets, pickled fruit, hummus and more. Photo's pretty fuzzy, but I think that was my low blood sugar. ABF's salad looks a lot more composed. Plenty of walnuts (I'm learning to love them thanks to his influence) and a lot more adventurous choosings than mine. This salad bar was so fresh that I have to say it was the best part of our meal. You can't go to Maine and NOT get chowdah--and here it is--the lightest, silkiest, tangiest clam chowdah EVER. You could taste the slight zing of white wine in this. Phenomenal. 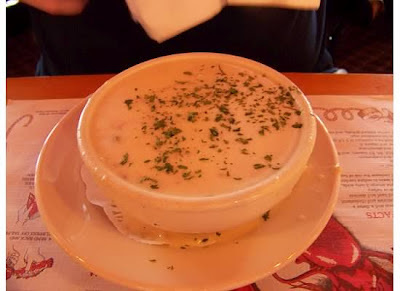 This is one of the best chowders I've ever had. No contest. I ordered the Lobster Newburg, a classic seafood dish. 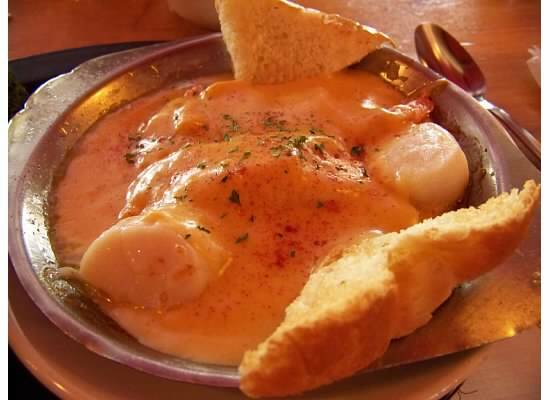 Warren's version has fresh haddock, scallops and shrimp baked in a hot casserole dish. They layered it with Newburg sauce (you could really taste the sherry in this version) and sourdough toast points. This was nice, but the chowder was still the star. 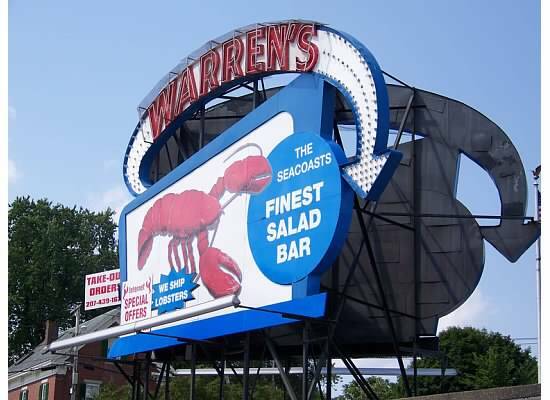 The claim on Warren's sign is no joke--this salad bar is like no other I've tried. I'm trying to figure out how I can get myself back here again ASAP for more salad and another bowl of that chowder! 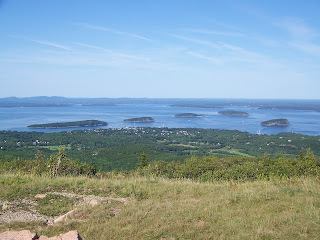 I recently took a 5-day vacation in Maine with my Awesome Boyfriend, aka ABF. On our last night there, we both 'splurged' on the lobstah dinners (my second that week, as ABF treated me to a lobstah dinner on my birthday too--see photo to the right!) 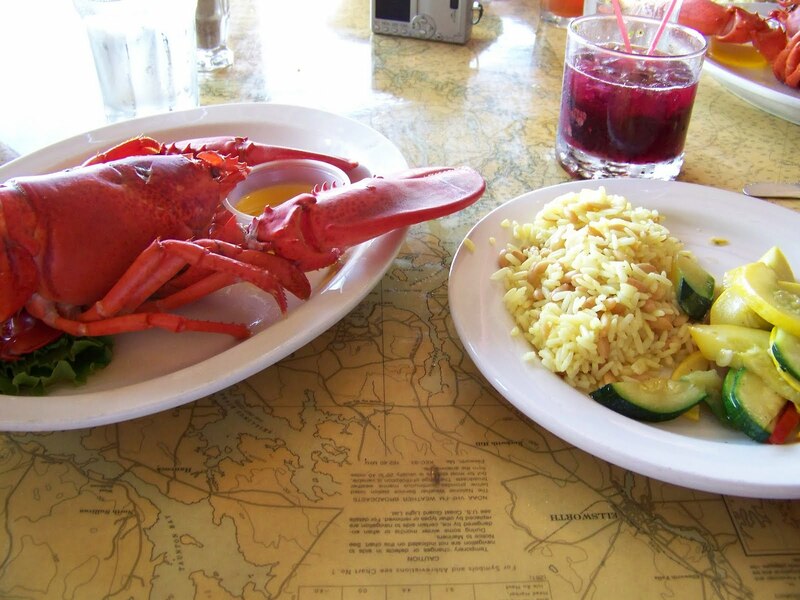 Lobster is one of the few things going DOWN in price these days--our three-course lobster dinners cost 25 dollars each!! Since I WAS in Maine, after all, I felt I had to order the drink du jour: the blueberry mojito. Normally, I see no need to mess around with liquid perfection. 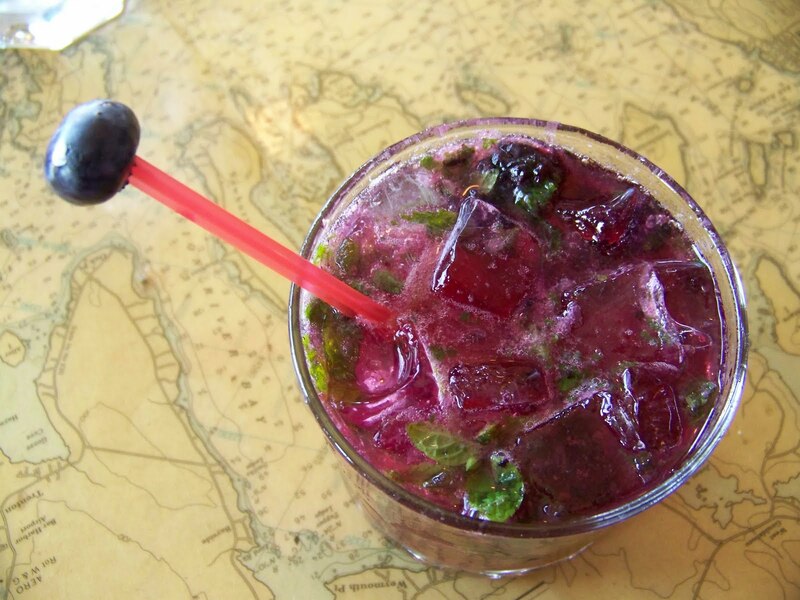 This drink sounded delicious though, and I was delighted to find it tasted like a mojito, yet also had a strong blueberry flavor. Two thumbs way up! We also got the standard lobster dinner--ABF had clam chowdah with his, and God love him, he was sweet enough to let me try a taste (or two!) It was pretty good, but still not the best (THAT was at a restaurant in Kittery, ME!). 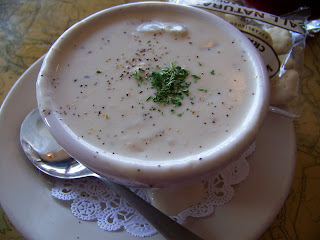 All this chowder, however, is giving me an increasing appreciation for good old cracked pepper. Yum. But this post isn't really about the savory stuff--let's skip right to dessert, though, shall we? The restaurant (The Quarter-Deck) offered several options, but the last two piqued my interest. You could have blueberry ice cream, or you could have blueberry pie with vanilla ice cream. I wanted BOTH blueberry pie AND blueberry ice cream. My boyfriend is not the type to make special requests, but I am (when they are perfectly reasonable!!) 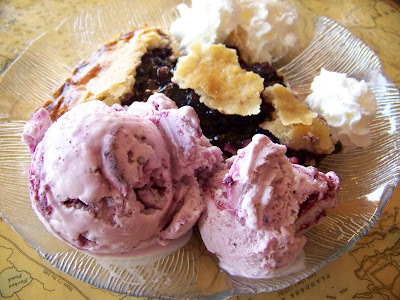 I dared to ask the waiter if we could get blueberry ice cream WITH our blueberry pie...and he said yes, of course! I beamed gratefully and waited for the purply, wonderful treat to arrive. And yea, verily, it was good.